The 2014 season for South African apples and pears has begun. Key varieties such as bright green Granny Smith apples, smooth Bon Chretien or creamy Packham’s pears will be widely available in supermarkets throughout the UK summer. 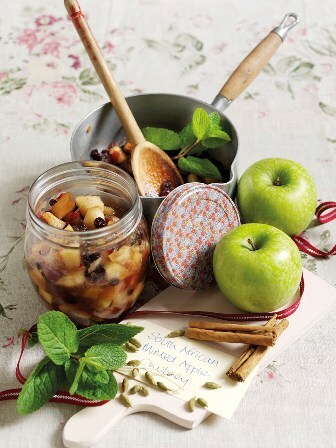 Award-winning South African chef, Reuben Riffel has created a selection of fresh summer recipes featuring apples and pears from South Africa. These recipes are free to use in your publication. Contact details for these and for more information can be found at the end of the release. 1. In a large saucepan set over medium heat, combine the onion, garlic, ginger, currants, sugar, honey, cider vinegar, lemon juice, orange juice, chili, cloves, allspice, cardamom pods and cinnamon stick. 2. Cook until reduced by two-thirds, about 15 minutes. Add the apples and cook until they are tender and the liquid has almost evaporated, about 20 to 25 minutes. Cool to room temperature, remove and discard the cinnamon stick. 3. Stir in the mint just before serving. Serve at room temperature or store in the fridge in an airtight container for up to 5 days. 1. Put the pears into a medium saucepan with the water, vanilla and half the sugar. Heat gently until the sugar dissolves. Bring to the boil, then reduce the heat and cook, turning the pears occasionally, for about 10 minutes, or until tender. Use a slotted spoon to transfer the pears to a plate to drain. 2. Preheat the oven to 190°C, fan oven 170°C, Gas Mark 5. Put 10 paper muffin cases onto a baking sheet or into a muffin tin. 3. Whisk 2 tbsp cocoa powder into the pear cooking syrup. Simmer for 15 minutes or until the syrup has reduced and is slightly thickened. Set aside. 4. Meanwhile, melt the chocolate and butter in a heatproof bowl placed over a saucepan of simmering water (make sure the bowl doesn’t touch the water). Use a metal spoon to stir until the mixture is smooth. Remove from heat. 5. Add the combined flours, eggs, 1 tbsp cocoa powder and remaining 150g sugar to the chocolate and butter mixture and stir until well combined. 6. Share the mixture between the muffin cases. Gently press a pear quarter into the middle of each one – you’ll have 2 pieces left to eat! Bake for 20-25 minutes. Set aside for 15 minutes to cool, then serve, drizzled with the chocolate syrup. 1. Preheat the oven to 180°C, fan oven 160°C, Gas Mark 4. Adjust the oven shelf to the centre of the oven. Grease and line a 20cm round loose-based cake tin. 2. In a small bowl, mix together the flour, baking powder and salt. 4. Peel and core the apples, then dice them into 3cm pieces. 5. In a large bowl, beat the eggs until foamy then whisk in the sugar, then add the vanilla. Whisk in half of the flour mixture, and then gently stir in half of the melted butter. Stir in the remaining flour mixture, then the rest of the butter. 6. Fold in the apple cubes until they’re well-coated with the batter. Transfer the mixture to the prepared tin and smooth the top a little. 7. Bake the cake for 50-55 minutes, or until a fine skewer inserted into the centre comes out clean. Let the cake cool for 10 minutes, then remove from the tin and cool on a wire rack. Remove the lining paper, then serve with whipped cream or creme fraiche.